Most people are saying the new year is right around the corner but to me, it sort of feels like it’s standing on the front steps of my house trying to peek through the window. I know it’s on its way and I’m both excited and a little anxious about it. Anxious because I have big goals that will practically catapult me from my comfort zone and since I refuse to “play small,” I’m hoping to land somewhere soft and squishy. Either way, this lady is taking flight. So, now it’s time to prepare for how to best enjoy the ride next year. Today I want to share with you how doing the seven things listed below helped me up-level this year in 2017 and how you can do the same. The success you seek can and will be yours if you prepare properly. You're probably glad you didn't see the Ghost of Christmas Past this season, but don't think you get to skimp out on revisiting and reflecting on the year, as a whole. We don't want to get stuck in the past and live there but at the end of the year, it’s important to revisit and reflect on your lessons. This includes lessons that were disguised as mistakes and failures. I always preach about focusing on the positive, learning your lesson, and moving forward but this is the one time when I need you to also review what went “wrong.” Review both the good and the bad. The sole purpose of this is not to strike at your ego but to instead make sure you don’t make the same mistake(s) again. Take the time to determine if there was anything else you could’ve done in those moments in order to produce a different outcome. Don’t go crazy over this exercise but begin to list some tweaks or alternatives to some of your failures so you have something to either avoid or apply in the future. This may be a good time to let you know, it's okay to cry, it's okay to get angry, it's okay want to hide under the covers. Not that you needed my permission, but feel free too do all of these. Just don't stay there for long. Find Your Lesson. Celebrate Your Wins. Then, move on. This is different from setting your goals and having a long list of commitments and resolutions to follow. Instead, choosing your theme for the year is choosing ONE WORD to identify your focus for the year. The one word that you choose then becomes your theme for the year. For example, in 2016 I struggled with being consistent and I knew that If I were consistent I would see greater growth and success in my life and business. Therefore, for 2017, my theme word was Consistency! By focusing on my one theme word I was able to intentionally set goals in a way that represented my word for the year. What was your word for 2017? Do you know your word for 2018, yet? Comment below so I can celebrate you and learn more about your great theme word. Are you a fan of Oprah? I almost feel weird asking that because I’ve never met or heard of someone not liking her lol. I pretty much think she's phenomenal and I'd absolutely love to meet her someday. Especially when I think of her humble beginnings living with her grandmother on and the trials and tribulations she went through to get to the high level of achievement and wealth that she's at today. I truly admire her, but this post isn't about my admiration for her lol. I want to introduce to you a principle rule that is the foundation for how Oprah runs her shows, her life, and pretty much anything she does. It is called the “Power of Intention.” I’ve heard her speak about intentions in interviews before but recently I watched a short clip (4:24) on her show Super Soul Sunday, where Oprah has a sit-down chat with Gary Zukuv, a spiritual teacher, and four consecutive New York Times Best Seller. Gary Z: That is it. That is at the heart of creating authentic power. I found the power of intention to be very refreshing and very effective. It’s a step up from goal setting. I’ve found that intentions go beyond the norm of “set the goal then chase after it.” Intentions, instead allow us to set the tone for how we want to feel about who we are, the result of our anticipated action, and what good we want to come of it. Plus, Oprah does it so it’s a good idea, lol. Now that you’re a pro at setting your intentions, it’s time to set your goals too! So, ask yourself, “what the heck do I want to accomplish?” Setting goals allow you to choose your focus and create a plan to accomplish them. I usually take some quiet time with myself, to establish what I want to see come to fruition. I decide if I want to hit a specific audience goal, income goal, happiness goal, etc. Depending on who you are, what your intentions are for your future, and the look and feel of your desires, your goals can look quite unique. Make sure you customize them to You and what You want. This part may not be entirely easy for some, if you’re married or you have children to consider, so try your best to look out for yourself and your family as well. "If you want abundance to enter your life, you have to make room for it." It’s important that you make space for all the amazing life changes that are on it’s way to you. Imagine you have a beautiful crystal glass but it’s full of spoiled milk and you want to replace it with champagne. In order to do this, you have to pour out the milk and if you don’t, there’s going to be a disastrous and smelly pool of milk and champagne on the table. I'm sure you wouldn't want that. Therefore, set time aside to declutter and detox. Review your relationships, your home, your car, your wardrobe, your work environment. Check it all and if anything no longer lights you up, makes you feel good, or helps you grow, trash it, donate it, and/or detach from it. 1. Get rid of old undergarments, torn clothes, stained pajamas, clothes that don't fit well, etc. 3. Re-evaluate the people in your life (friends, relatives, associates, co-workers.) If there are people who are often in your company but don't encourage you to grow, be happy, or feel loved, it's likely they are a poor influence and are stripping you of your joy. If you're no longer enrolled in a higher education program at a university or college, it doesn't mean your education is over. In order to be successful, you should be constantly expanding your knowledge base. You may be very familiar with the traditional form of education that require you to attend in-person classes, but there are plenty of people in the online world who are skilled at teaching as well (including me). I encourage you to explore and look for someone who is experienced in the field of study you are interested in. The practice of you underestimating yourself ends here! You are reading this blog right now because you’ve been underestimating yourself. I’m someone who has underestimated myself and I also know what it’s like to believe in myself and go after my dreams. Trust me when I tell you the latter is so much better! Besides, you’re already familiar with what life looks like when you don’t “Own Your Power,” so imagine how great things can become if you DO. Imagine being on the other side of you walking in your authentic power, accomplishing goals left and right, attracting amazing people and opportunities, even increasing your income. I didn’t tell you but you already had a little action warm-up with # 5 hehe. Now, I want you to really get it crackin'. If you want results you have to take action and I don’t just mean pray about it. I love God and I will gladly pray and speak over opportunities often, but it’s not always enough. I learned I also had to “Do The Work.” Before becoming a published author I had to write the book, design the cover, and hire an editor. Before becoming the CEO of two companies, I had to design my business, create a plan, invest, and form the corporations. I had to “DO” because “DREAMING” was not enough. So, if you thought you could just “wish” your way to success, I’m sorry, not sorry, that I just burst your bubble. That’s why it’s so important to choose to do the things you love and are passionate about. Nobody wants the work to feel like work so when you choose to do something you enjoy, it’ll feel more like partaking in a satisfying hobby and less like a chore. 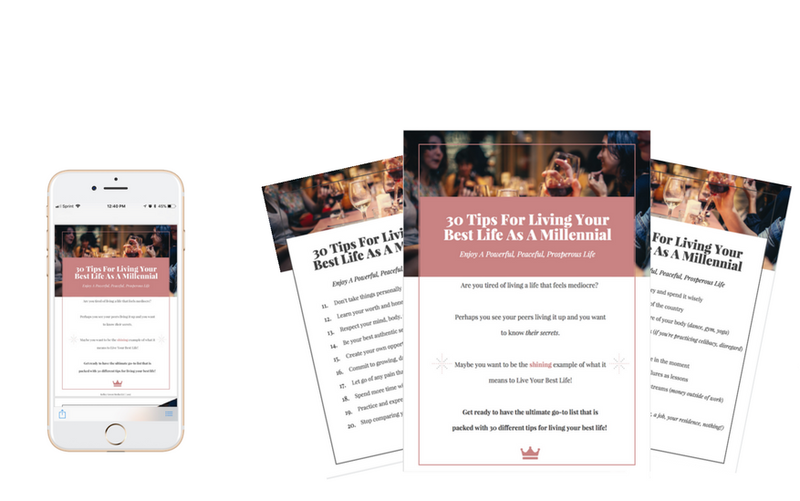 This is a must have list for any millennial who is looking to live her best life! If you didn't hear it enough or even at all this year, I want you to know I'm proud of you. Not just for taking the time to work on your personal development by reading this post but for all the effort you put into growing this year. Whether that growth was voluntary or because of unexpected experiences you made it through. I am celebrating you. Thank you for being here :).